WTIX-FM is JD's current home on the airwaves of New Orleans at 94.3 MHz. Here are photos of the transmitter site, and from varous WTIX-FM events over the years. 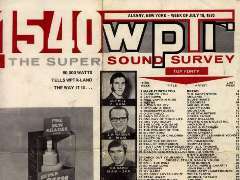 One of the first "Top 40" radio staions in the nation, WTIX was "The Mighty 690" for most of its life in New Orleans. Here are the memorabilia. WNOE, "a Governor James A. Noe station" was JD's address for a couple of years in the mid 70's. No photos of him here, but he did take a few. And there are others. In the 70's, WNOE-FM shared the Bienville Street studios in the French Quarter with its AM sister station, and was one of the two major FM rockers. Here's a look inside. 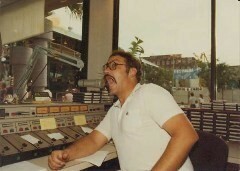 JD spent 15 years or so as a jock, as well as a brief stint as Chief Engineer, at WRNO in its New Orleans heyday from the 70's to the early 90's. Here are the photos and surveys from back in the day. WIXO was JD's first New Orleans gig. At 98.5 MHz on the FM dial, it was supposed to be a hybrid of the Top 40 music on WTIX-AM and the album rock on WRNO. It lasted a little over three years. JD was there and played the last songs (The End and Her Majesty from the Beatles’ Abbey Road album) when it went dark in September, 1974. A few months later, it was WYLD-FM. WQUE at 93.3 was "Q-93," and still is. Its format now is urban and often near the top of the New Orleans ratings. In the 70's and 80's, it wasn't quite so urban. Here's what the museum has from that time. WRPI was JD's college station. It started with 1,000 watts of monaural on a 40-foot antenna in 1957. During JD's sophomore year from 1968-1969, he helped rebuild the studios for stereo to feed a new 10,000-watt, 700-foot transmitter-and-antenna combination with a progressive rock format that was ratings-competitive with the commercial stations in the market. Here's what it looked like, then and at its 50th anniversary in 2007. WPTR in Albany, NY was JD's first paid radio gig. He did weekends while in college, and the all-night show afterward in the eraly 70's.